The modern lifestyle lures us with comfort and convenience, in the form of gadgets and gizmos that have become vital to our daily lives. But it comes with a big price tag and we pay for it with lifestyle diseases like obesity, hypertension and cardiac problems, among others. Excessive use of cell phones, laptops, dishwashers and the like pose a serious threat to our health. They make us physically inactive and put us at an increased risk of diseases like cancer, diabetes, obesity and cardiac troubles. Also, many gadgets, including like hair dryers, electric shavers and digital clocks, give out waves of electromagnetic radiation that pass through our bodies and disturb our biological processes. Social networking websites have replaced face to face contact, making people secluded. Radiation from cell phones is known to affect the brain cells and also reduce sperm count in men. Use of earphones can lead to hearing loss and headaches. Increased screen time leads to blurred vision, red eyes, difficulty in focusing and weak eyesight. Frequent use of keyboards and cell phone keys leads to orthopedic problems. Staying immobile for more than four hours increases the risk of heart disease. Lack of physical activity decreases bone mineral density and lowers immunity. Sedentary lifestyle amplifies loneliness, depression, anxiety and panic disorders. It is therefore important to consider how much time you spend sitting every day. Nowadays, so many simple things in life are now just a click away, whether it's paying bills online, shopping online, studying online, etc. In the past, doing these same things would have required you to get up and move. Surya Namaskar is not only a great warm up exercise but it also helps to shed those extra pounds. Cobra Pose strengthens the upper back and helps correct the bad posture caused by long desk jobs. Eye, neck, shoulder, wrist and ankle rotations help counter stiffness whilst sitting at a desk. Shalabhasana relieves lower back pain that is caused by hours of perching on a chair. Downward Dog Pose and Sarvangasana help to reverse the blood flow in your body, thereby preventing baldness and premature graying. Gomukhasana prevents cervical pain, which is becoming increasingly common. This asana can be practiced while seated on a chair. Take short walks at home and at work. Use noise canceling headphones, so that you don't have to keep the volume as high. Play outdoor games for entertainment, instead of sitting in front of a screen. Increase your blink rate to 6-8 blinks per minute to avoid eye strain. Conduct your meetings standing up. 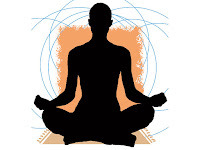 Regularly practice relaxation techniques like breathing and meditation.